In this photo taken on Tuesday, Nov. 8, 2016, Natalia Veselnitskaya is seen in Moscow, Russia. The Russian lawyer who met with Donald Trump Jr. in 2016 had deeper ties to the Kremlin than previously disclosed and worked with Russia's chief legal office, according to emails obtained by NBC News. The emails the Dossier organization said it was sent suggest Natalia Veselnitskaya worked closely with an official at the office of Russia's prosecutor-general to impede an investigation by the U.S Justice Department into a Russian businessman. The emails suggest Veselnitskaya was involved in coordinating a government response to the U.S. case, NBC chief foreign correspondent Richard Engel reported. Click here to watch a segment of Veselnitskaya's interview with Engel on MSNBC. Dossier is an arm of tycoon and Kremlin critic Mikhail Khodorkovsky. 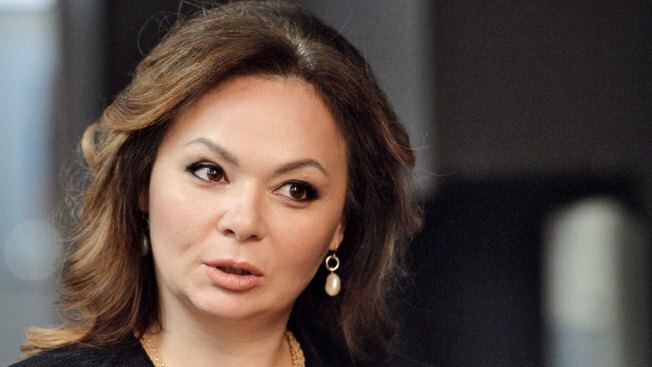 Veselnitskaya has denied having connections to the Kremlin since her meeting with then-candidate Donald Trump's son, son-in-law and campaign chairman at Trump Tower. The encounter took place after Donald Trump Jr. was told she had potentially incriminating information about Trump's election opponent, Hillary Clinton. When asked by Engel if the emails suggest that she tried to obstruct justice, Veselnitskaya replied: "What obstruction? What are you talking about? ... I want to have it on the record." Veselnitskaya is a well-connected Moscow lawyer, but the extent of her government ties has been unclear since she was identified as a participant in the 2016 Trump Tower meeting. Veselnitskaya's full interview airs Friday at 9 p.m. ET on "On Assignment With Richard Engel."